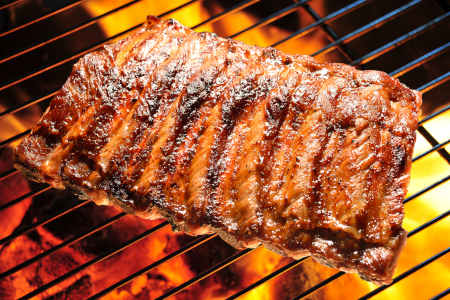 Simply the best BBQ ribs recipes are here for you together with preparation and cooking tips. All have different flavour dimensions from varying influences around the globe so no matter what your preference, follow my preparation and you''ll be cooking the best you've ever tasted in no time. Whichever recipe has whet your appetite, use my guide to prepare the best BBQ ribs you’ve ever tasted. 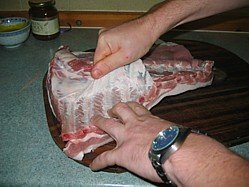 We’ll start with the different cuts of pork ribs and then work through a three step process for preparation. The rib of the pig is split into three jointed bones. 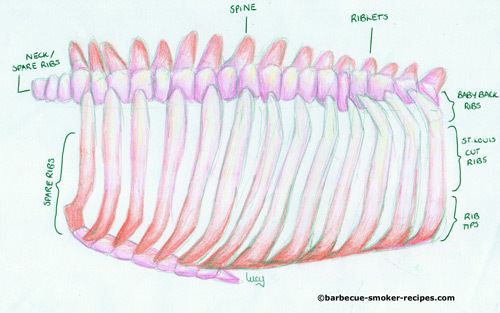 The closest to the spine are the baby back ribs, then come the St Louis ribs and finally the third joint is the rib tip. 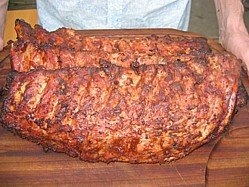 My favourite bbq ribs recipes use the baby back (loin back) ribs because not only do the look good without a great deal of trimming, they are easy to prepare and a side is pretty much good enough to settle any appetite. From a practical perspective a side of baby back ribs sits easily in a rib rack and that means I can get a good number of sides in a kamado with room to spare. They also cook pretty quickly too. How much meat is on your ribs depends on your butcher and how close to the bone he / she trims the loin. Get to know your butcher because that way you’ll get ribs trimmed just the way you like and if you ask nicely you’ll also get the membrane removed (step 1 in the preparation process). Apply your rub – this is the first layer of flavour, apply liberally to all sides of the ribs, work it into the meat and then put your ribs to one side for a number of hours (overnight is best) to allow the flavours to work together. Some will recommend coating your ribs with oil before applying the rub because this helps the rub stick to the meat and form the bark (crispy outside) and whilst it does help a little I’m not convinced that important. I just apply my rub directly to the meat. 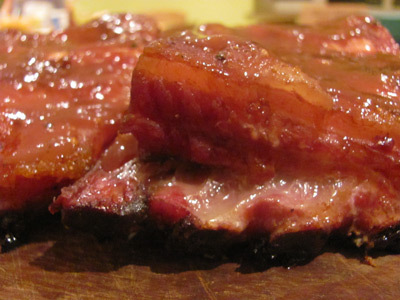 Make your sauce – the third and final step can be done whilst the ribs are cooking. You can apply your sauce onto the ribs in the final 30 minutes of so or just keep your sauce warm and pour over when you serve…or both. I prefer to pour the sauce on after and this is purely from a practical point of view because most sauces contain an element of sugar and it makes an awful mess inside my smoker. If you do choose to mop it onto your ribs whilst cooking, don’t apply your sauce earlier than 30 minutes before the end otherwise it’ll burn. All the smoked BBQ ribs recipes below rely on indirect cooking, read my smoker instructions manual to guide you through the basics. You can still grill ribs, it’s not sacrilegious but if you’ve got the time then smoking is the way to go. Grilling ribs is a practical approach when constrained either by time or equipment so click here for grilled bbq ribs recipes. My rule of thumb for bbq ribs recipes is 3-4 hours for baby backs and 5 hours for the St Louis or spare rib cut at 110°C or 225°F. This will differ depending on the number of rib racks you’re cooking, how much meat you have on the ribs and how you like them so this is where your own experience has to be added to the mix. I also like to use a water bath under the ribs. Note: I cook on a Monolith kamado ceramic barbecue. For me ceramic barbecues give stability in temperature and juicy results without having to wrap the ribs. Other than straight hot smoking, there's one other method worthy of mention. Put simply this is pretty much a fail-safe method where cooking is stripped back into 3 clear steps. In short, step 1 gets the flavour bedded in, step 2 tenderizes and step 3 to finish off. It certainly works and it is consistent but I find that the 2 hours wrapped can overdo the tenderness. This of course is personal opinion. 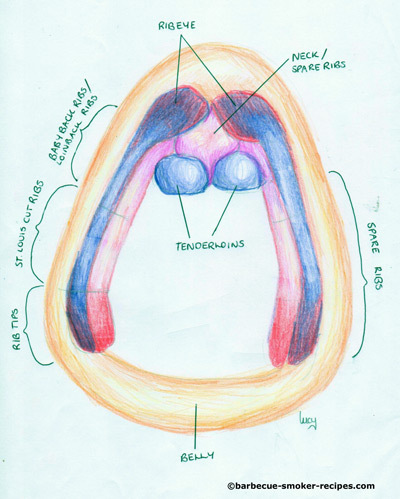 Ribs don’t have to fall off the bone to be cooked (or indeed ideal), I prefer my ribs to be tender but still have a little bite and tear in them, after all, that’s why I have a full set of teeth! To test that your ribs are cooked simply pick up a side and try to pull two ribs apart. If cooked they should separate relatively easily but if you want "fall off the bone" tenderness then give the 3-2-1 method a go. If using a BBQ thermometer then check for an internal temperature in the thickest part of the meat of 160°F (71°C). Out of all the BBQ ribs recipes this is the one we serve time and time again when out catering and it never ceases to deliver awesome feedback. The rub quantity in this bbq ribs recipe is about enough for two racks of ribs so multiply it out depending on how many you are cooking for. Use my easy homemade barbecue sauce. For the rub, simply mix together all the ingredients and then rub all over the ribs and set aside for an hour (or overnight). For the sauce, mix everything together in a saucepan and bring to a simmer for about 15 minutes so that the sugar dissolves. During the last 10 or 15 minutes of cooking, lift the lid on the smoker and apply the sauce. Don't take too long over this otherwise you'll lose all the heat out of the smoker. When done, remove the ribs from the smoker and allow to stand for 20 minutes before slicing and serving. Mix and match, the rub below is hotter, the honey sauce is sweeter. Follow the basic ribs preparation above and substitute one or both of these two recipes into the mix dependent on how you like it. If the rub recipe above was good but just not hot enough for you then go with this rub. Always read the label on any processed ingredients so take care to read the label on the ketchup bottle and your chilli sauce bottle. For sure the soy sauce will have gluten unless you substitute with Tamari. It's a hot one...you have been warned! Mix up all the ingredients in a saucepan, warm gently to lower the viscosity. 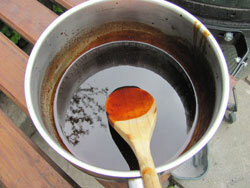 This honey barbecue glaze contains honey and sugar so too high a heat and you’ll burn it. To get the caramelized flavour we’re looking for it's best to apply the glaze in the last 15 minutes of cooking or right at the end. There's a plethora of oriental flavours in the 4 BBQ ribs recipes below. The rub is common to all but then you can add any one of the four sauces. Let's start with the rub. Soy sauce will contain gluten and Thai fish sauce will contain fish. Check the label on your hoisin sauce unless you choose to use my home made recipe. Just throw all the rub ingredients in a pot or shaker and mix together. When mixed, sprinkle the rub onto both sides of the ribs, allow the ribs to stand for an hour or so before cooking. At the end of cooking add one of these four BBQ sauces. In each case (unless stated otherwise) it's simply a case of mix up the ingredients and stir whilst warming through. If using this sweet and sour sauce then check for gluten and fish in the soy and Worcestershire sauces. Both these ingredients can be substituted with gluten free alternatives as can the vinegar. Bring to the boil and simmer for approx 30 minutes until the sauce is nice and thick. Throw all of the Batch 1 ingredients together except the coriander in a frying pan over a medium heat for 2-3 minutes until soft. You're looking to soften everything not burn it so don't let your pan get too hot. After a couple of minutes throw in the ground coriander, mix it in and stir for a further minute to allow the spice to cook. Now throw in the ingredients for Batch 2. Stir the sauce until evenly mixed. Plum sauce is a classic Chinese ingredient so as with the bbq ribs recipes above, start with the Chinese rub and than add this sauce at the end of the cookout. Gluten in the soy sauce and check the label on the plum sauce. TIP - be careful with the salt because there’s a fair amount of salt in the soy sauce. 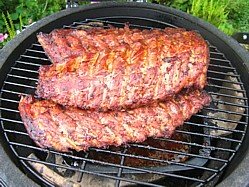 There's no straight answer how to grill pork ribs, it depends on your taste and what you are trying to achieve. If you're looking to try and mimic BBQ smoked ribs then (in my view) you have to cook them first so essentially the grill is used simply to warm them through and add a bit of char flavour. That said, I also have a Basque recipe here from my buddy Manu who lives in Spain, it works, it tastes great but it's a completely different texture to American style BBQ ribs. Boil them or oven cook them, whichever way you go you're not going to save time over smoking them so why go to all this trouble? You can cook the ribs in advance and then finish them off over the camp fire. Maybe you're tailgating or on the beach with a small disposable charcoal barbecue grill - it's at these times that you need a grilled bbq ribs recipe. Cook the ribs in advance, you can them freeze them and pull them out when you need them. To be fair, texture-wise and flavour-wise, it's never going to be exactly like the results you get from cooking low and slow, just agree it's different. If ribs are your thing and there's no smoker in sight, this is your best option. If you can cook on a smoker then try the 3-2-1 method that I described above. Take the first 2 steps as the pre-cook and then use the final 1 hour to grill the ribs and bring them up to temperature. For oven cooking, just follow my classic smoked ribs recipe and substitute a foiled tray in the oven at 110°C or 225°F to put the ribs on. You can then pause when oven cooked and return them to the grill for 10 minutes and add sauce when you're ready to eat. The bbq ribs recipe below is for boiling. Inevitably the boiling process is going to take flavour out of the meat so this recipe is designed to bring other flavours into the mix. Pour the water into a large saucepan and bring to the boil. Add the onion, garlic, cloves, peppercorn and chili and simmer for about 15 – 20 minutes. Now add the ribs and continue to simmer for an hour ensuring that the ribs are at all times covered in water and once the hour is up, remove the ribs and allow to cool. Pour out ½ pint of the stock from the saucepan and boil vigorously to reduce the volume by half then add the ingredients for the BBQ glaze. Stir everything and when thoroughly the mixed, the glaze is ready. Now all you have to do is warm the ribs on the grill and brush with the glaze for five or ten minutes each side over medium coals and the jobs done. This Basque BBQ ribs recipe starts with an easy to make baste so it’s time to get that cover off the barbecue grill and fire up the coals! My friend Manu now lives near Valencia but he originates form the Northern Basque area of Spain. 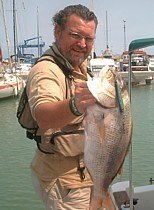 He loves fishing and hunting and is a real source of information when it comes to rustic traditional food cooked the way the Spanish love to cook it. Many men of the Basque country belong to men only cooking clubs called Txokos where recipes like this are handed down from Father to Son. Manu’s bbq ribs recipe is delightful in its simplicity, just a little basting during the cooking process and the flavor floods out. Try it today and get the real taste of Spain. Note - This is a completely different way to cook ribs, it's not the American way, it's the Spanish way. The taste and more importantly the texture is not the same. Do not expect this bbq ribs recipe to produce "fall off the bone" results because this isn't a low and slow cooking process. TIP - Keep the whole rack of ribs in one piece, it makes then easier to turn and stops them drying out during the cooking process. 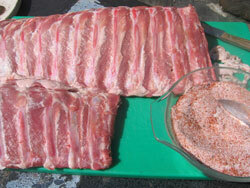 Season the ribs rack with the salt and pepper and slap them on the grill over medium hot coals. Mix up the crushed garlic, paprika and olive oil, brush it onto the ribs and continue to turn and baste occasionally through the cooking process. 15 or 20 minutes later you’ve got Basque ribs to die for. Take the rack off the grill and slice between the bones with a sharp carving knife. Your ribs will have a much firmer texture than smoked ribs with lots of juice so make sure that you cut up on a chopping board with a well. I hope that you enjoy them as much as I do.